Keep kids busy and quiet when travelling. ZuperKit offers ready-made travel kits filled with fun activity books or you can 'build your own' travel kit! Zuperkits are designed for ages 3-7 years old and you can choose between a boy or girl kit. 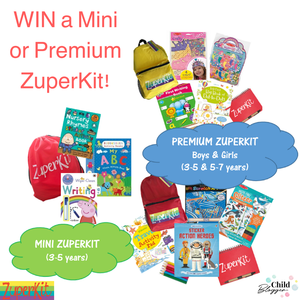 We are giving away a Mini ZuperKit valued at $29.95 and a Premium ZuperKit valued at $64.95. Competition closes 26 June 2018. © 2019. All trademarks and copyrights are owned by their respective owners. Win a $250,000 Round the World Holiday!